Israeli food enjoying a moment? You’ve got to be having a falafel — maybe from one of chef Einat Admony’s kitchens. One of her deep-fried chickpea balls is a treat that makes you wonder why this unfairly ignored culinary tradition isn’t on every street corner in the world. 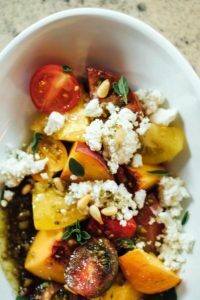 Admony owns a pair of hugely successful vegetarian food bars in New York called Taïm (Hebrew for “tasty”), serving Israeli-style falafels and smoothies, as well as a food truck that takes her wares to the street. She has two other restaurants in Manhattan: Balaboosta (it means “perfect housewife” in Yiddish), which opened in 2010 and features a Mediterranean take on Middle Eastern food, and Bar Bolonat, which opened in 2014 and produces Israeli dishes with a more modern, hip spin. In a city with a very strong Jewish food tradition, she is shaking up the very notion of what that is, becoming to the Big Apple what fellow Israeli Yotam Ottolenghi is to London. Her growing popularity may be due to her wealth of different influences. According to Admony, until recently, ordering Jewish food in America meant receiving the traditional staples of the Ashkenazi — Jews originally from Eastern Europe. “It was a lot of bagels, lox and smoked salmon; food that’s a little bit one-dimensional,” she says. Her approach to setting up her own eatery was also quite original. “I did the opposite to every chef,” says Admony, who opened her first Taïm restaurant in 2005. “All the fancy chefs are now opening fast casual dining restaurants because they realise that fine dining is slowly disappearing, though I do believe there is still a place for it, but it’s really hard. “Today, people can get fast, cheap, high-quality food in a different atmosphere. So a lot of chefs are now moving in that direction. 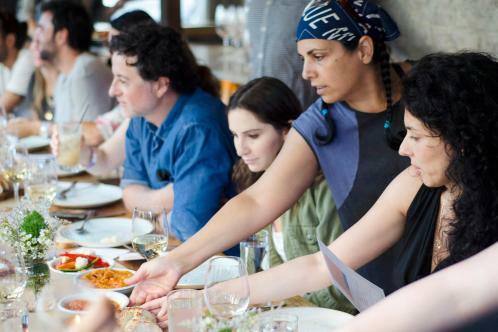 If Israeli food is having its fifteen minutes in New York, it is also enjoying a new vibrancy in its homeland. Admony and her husband, Stefan Nafziger, who runs the business end of things, travel to Israel several times a year, hunting down the most authentic Jewish and Palestinian recipes for all the dishes they feature. For Admony, the best variety is made by her French husband: the secret, she says, is to start with dried chickpeas rather than tinned; chill them quickly after they’ve been cooked, and when you’re whizzing up the mixture, add some of the cooking water that has been chilled to make the dip creamier. Admony says that when Taïm opened, dishes such as falafel and hummus were seen as niche and more associated with healthy vegetarian food. Now you can find hummus in McDonald’s. While Taïm is kosher, simply because as a vegetarian restaurant it made sense (all produce that grows in the soil or on plants, bushes, or trees is considered kosher), her other restaurants are not — she likes taking inspiration from broader sources and says she is too fond of shellfish, which is not allowed in a kosher diet. 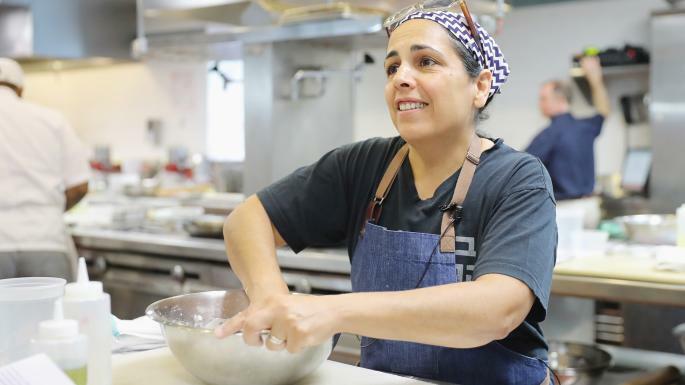 She believes the appreciation of such “new Israeli cuisine” has opened Americans up to the broader palette of Middle Eastern cooking, and her own menus draw inspiration from the whole transcontinental region. “It’s much more diverse than it used to be,” Admony says. “We have some dishes that can be very Ashkenazi and then some that are very Arabic. If it’s a Palestinian dish or Lebanese or Middle Eastern dish, I’m definitely not going to call it an Israeli dish. So too are Irish chefs. She visited Ireland last year with one of her best friends, Donal Crosbie, a Dubliner who is chef and partner of three New York restaurants, and met Paul Flynn, chef proprietor of the Tannery Restaurant, Townhouse and Cookery School in Dungarvan, Co Waterford. She and Flynn hatched a plan for a pop-up dinner at the Tannery, and in September she will be there, cooking some of the most popular dishes from her restaurants, including street food such as sabich: a sandwich of aubergine and hardboiled egg served with amba, a chutney made with creamed mango and fenugreek. There will also be burekkas — pastries stuffed with spinach, potato and cheese — and Lebanese kibbeh, croquettes of minced meat in a bulgur wheat crust, with yoghurt sauce. Admony’s Irish visit is a brief trip in a busy schedule: there are long-term plans to expand the Taïm chain, but more immediately, next month she opens Kish-Kash, a North African couscous restaurant in New York’s West Village. The eatery is named after the large sieve used to sift semolina, so it is safe to say her couscous preparation will be more labour intensive than making the instant variety from a box. The short menu will include Moroccan tagines, mafroum (beef-stuffed potatoes), and hraimeh (a spicy Libyan fish dish) eaten at a communal table: Admony may like shaking up tradition, but her latest concept comes from her memories of long, slow-braised Shabbat dinners at home in Israel.